Note that the new ERSSTv4 series is also included in Anim.1 (red curve), and that it distinctly supports the group of ‘others’: The light blue HadSST2 curve all of a sudden makes a giant upward leap of nearly 0.1K at the 1997-1998 transition (light green vertical line). There is hardly any divergence to be observed between it and the others, however, either before or after this point (save that from ERSSTv4 post 2005; more on that later …). I’ve noted this [upward step relative to other SST datasets] in comments on numerous blogs over the past year, but have chosen not to offer an explanation for what appears to be the reason for the difference. 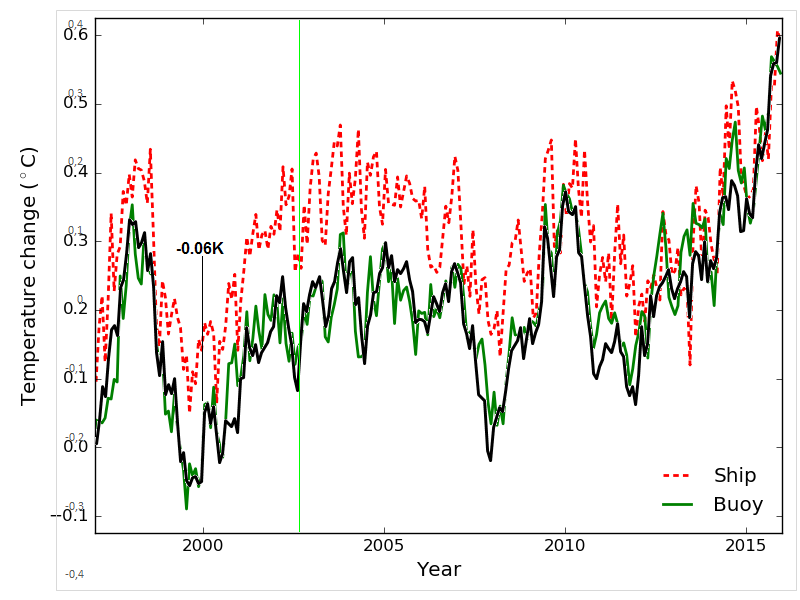 The change of data set also helps explain why HADCRUT3 Global, Northern Hemisphere, and Southern Hemisphere data sets consistently run high since the 1997/98 El Niño when compared to other land and sea surface temperature data sets. 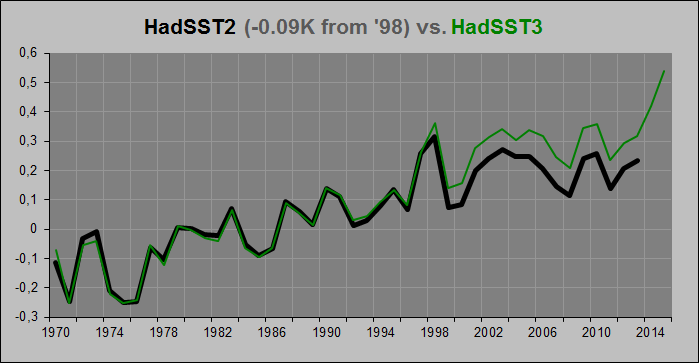 So why was this obvious 1997/98 upward step in the HadSST2 dataset, a clear error of calibration when stitching together SST data from two independent (and “not fully consistent”) sources, never corrected? Why was it never even mentioned or noted as a ‘thing’? Who knows? But one can’t help but wonder how the people at the UKMO would’ve reacted (and how fast) if the error instead happened to go the other way, creating a sudden artificial downward step across the seam. For now, simply bear this peculiar case of ‘inattention’ in mind. And let’s go back to find the reasoning behind the HadSST satellite era upgrade (HadSST2 → HadSST3), as per the central paper on this issue: Kennedy et al., 2011. What did it claim as the cause of the long-term cooling bias in the recorded global SSTa since ~1979? It has been noted a number of times (e.g. Emery et al. ) that ships are biased warm relative to drifting buoys and that this relative bias has not changed significantly over the period 1989-2006 (Reynolds et al. ). As the numbers of drifting buoys has increased over time and the number of ships has decreased, there is likely to be an artificial reduction of the trend in global average temperatures. Therefore, the difference between ships and drifters needs to be factored into the bias calculation. A database of nearly coincident ship and buoy observations for the period 1998-2007 was created in which ship-buoy pairs were selected that lay within 50km of one another and on the same day. To avoid complications from diurnal heating, only observations taken close to local dawn were used. The average differences were calculated for each ocean basin, and for the globe. The average difference between ship and drifting buoy observations in the period 1998-2007 was 0.12◦C, with ships being warmer than drifting buoys. 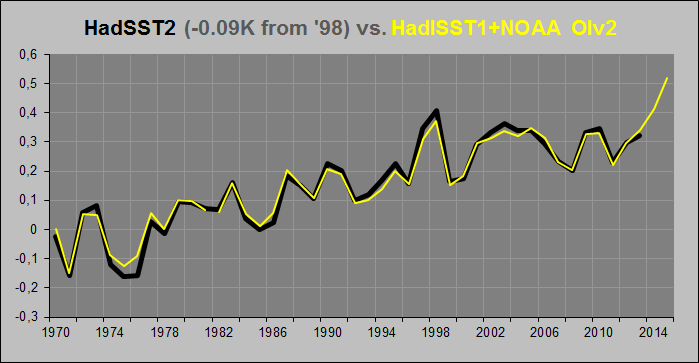 The argument, then, apparently goes like this: The SSTs reported by drifting buoys are on average 0.12 degrees cooler than those reported by ships, and so, since the former’s share of the total (combined) amount of SST measurements globally increased from 0% in 1978/79 to almost 70% at the end of 2006 (Fig.1 above), and around 90% today (Huang et al., 2015 (linked below); Fig.12 below), then not correcting for this change will lead to an underestimation of the overall rise in global SST (and also, it is claimed, in SSTa) of about 0.08 degrees from 1979 to 2006, 0.1-0.11 degrees from 1979 till today. Well, the HadSST2 dataset specifically does NOT contain a correction for this alleged ship-buoy cooling bias, while the HadSST3 specifically DOES. Apparently. Allegedly. This is, after all, one of the stated reasons why the 2011 HadSST update was deemed necessary in the first place. Where’s the upward adjustment? Correcting for the ship-buoy cooling bias. Distinguishing HadSST3 from HadSST2 … It very much appears not to be there at all. Did they simply leave the artificial warming in HadSST2, from a clear calibration error which quite frankly should have been corrected for, untouched, rather justifying keeping it in place by thinking that a new-found (and apparently ‘needed’) upward adjustment from some completely different and totally unrelated cause would cover for it anyway? This, however, never happened. And now they found a way to avoid making this correction altogether? They had effectively found a neat way of circumventing the whole (and what would’ve been a rather embarrassing) issue? Either they will have to explain Fig.2 above; why no apparent upward ship-buoy bias adjustment? Or they will have to explain Fig.3; why more or less the entire upward ship-buoy bias adjustment in ONE sudden step alone? People should’ve asked the UKMO these two simple questions. And forced them to provide an answer. Their peers should’ve asked them. Other (third-party) ‘experts’ in the field. Yet no one did. And no one has. By most measures, a very good match indeed. How about the ERSSTv3b, the ‘old’ ERSST series? Now, isn’t this remarkable? Why would the ERSSTv4 dataset agree much better with the low-tracing (down-adjusted) and non-bias-corrected version of the HadSST series (v2, above) than with the high-tracing, bias-corrected one (v3, below), especially and most notably along the crucial section between 1974 and 2006? In addition to the ship SST bias adjustment, the drifting and moored buoy SSTs in ERSST.v4 are adjusted toward ship SSTs, which was not done in ERSST.v3b. Since 1980 the global marine observations have gone from a mix of roughly 10% buoys and 90% ship-based measurements to 90% buoys and 10% ship measurements (Kennedy et al. 2011). Several papers have highlighted, using a variety of methods, differences in the random biases, and a systematic difference between ship-based and buoy-based measurements, with buoy observations systematically cooler than ship observations (Reynolds et al. 2002, 2010; Kent et al. 2010; among others). Here the adjustment is determined by 1) calculating the collocated ship-buoy SST difference over the global ocean from 1982 to 2012, 2) calculating the global areal weighted average of ship-buoy SST difference, 3) applying a 12-month running filter to the global averaged ship-buoy SST difference, and 4) evaluating the mean difference and its STD of ship-buoy SSTs based on the data from 1990 to 2012 (the data are noisy before 1990 due to sparse buoy observations). The mean difference of ship-buoy data between 1990 and 2012 is 0.12°C with a STD of 0.04°C (all rounded to hundredths in precision). The mean difference of 0.12°C is at the lower end of published values of 0.12° to 0.18°C (e.g., Reynolds et al. 2002, 2010; Kent et al. 2010). 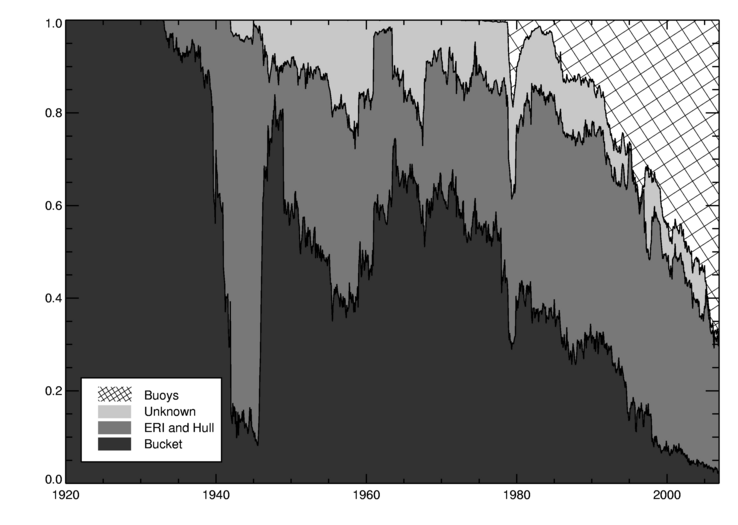 Although buoy SSTs are generally more homogeneous than ship SSTs, they are adjusted here because otherwise it would be necessary to adjust ship SSTs before 1980 when there were no or very few buoys. 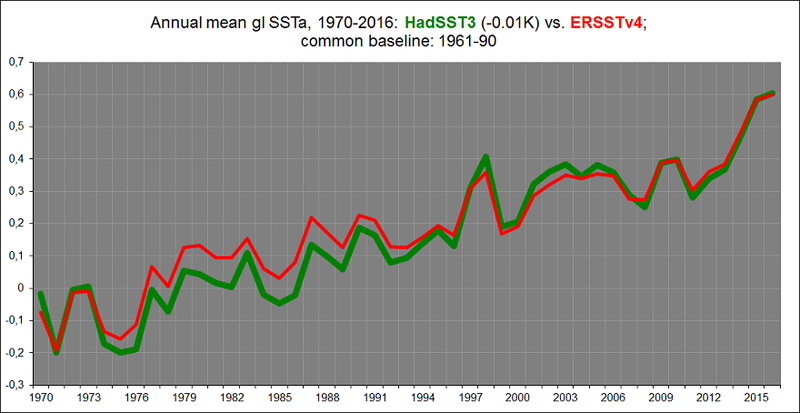 As expected, the global averaged SSTA trends between 1901 and 2012 (refer to Table 2) are the same whether buoy SSTs are adjusted to ship SSTs or the reverse. 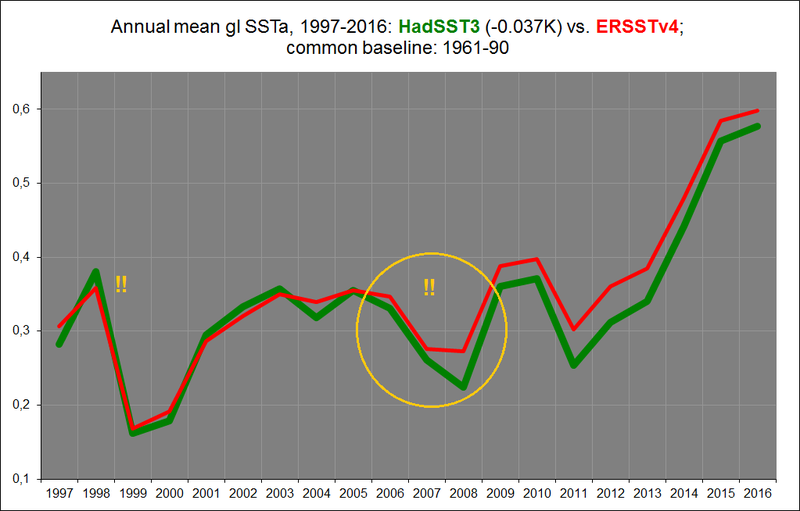 However, the global mean SST is 0.06°C warmer after 1980 in ERSST.v4 because of the buoy adjustments (not shown) and there are therefore impacts on the long-term trends compared to applying no adjustment to account for the change in observational platforms. So, very much the same reasoning behind the claimed need for an upward adjustment post 1979 as in Kennedy et al., 2011. We’ll get back to that 0.06 degrees of extra warming after 1980 in the ERSSTv4 dataset in a bit. 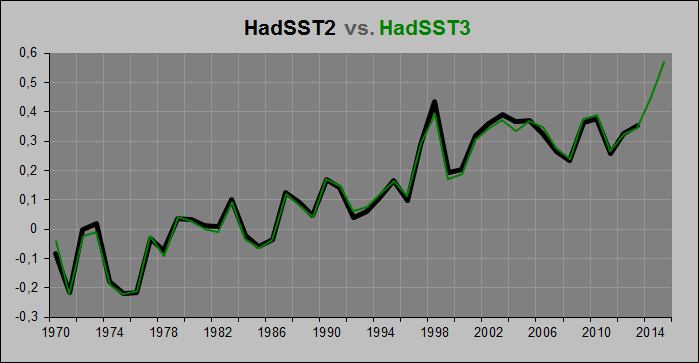 But first, what’s perhaps even more bizarre when comparing HadSST3 and ERSSTv4 is this: The ERSSTv4 dataset is apparently, once again according to Huang et al., validated against (tuned to fit) the HadNMAT2 series, a Hadley Centre product of night marine air temps. 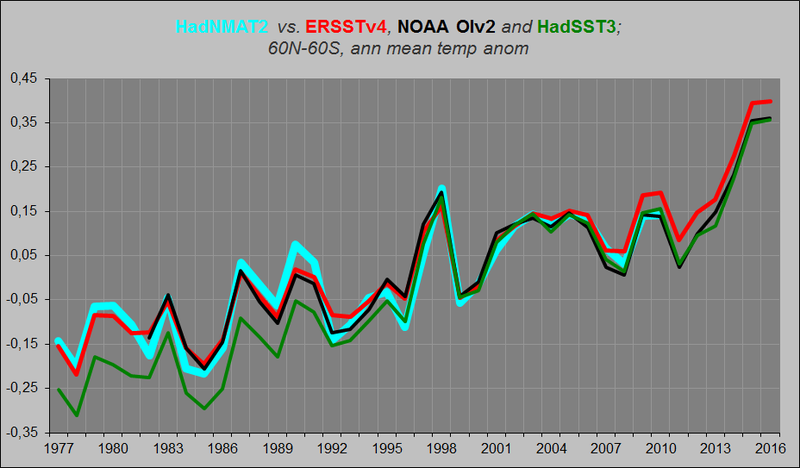 So why does ERSSTv4 agree much better with the HadNMAT2 data (Fig.8) than the Hadley Centre’s own HadSST3 series (Fig.9)? 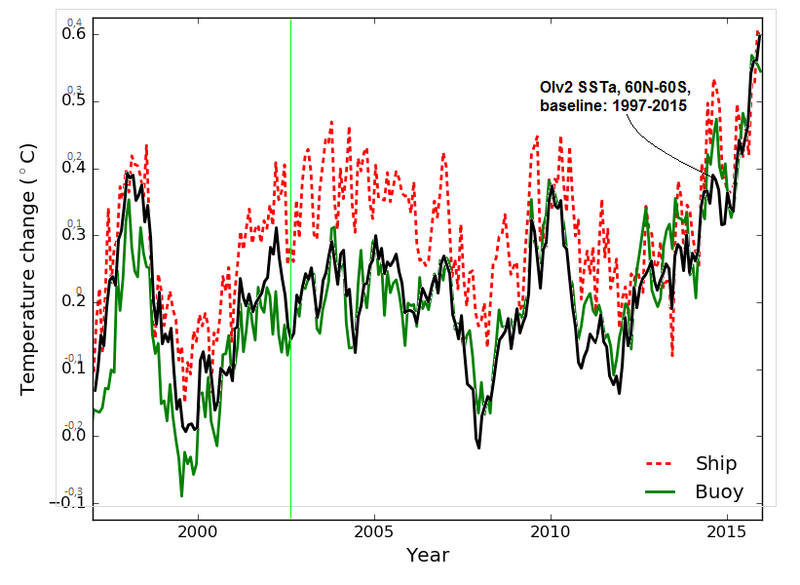 And why does a non-ship/buoy bias corrected (satellite based) SST dataset like NOAA (Reynolds) OIv2 (Fig.4 above) appear to agree better than either of them? Could it be that the claim of ‘necessity’ of the so-called ship-buoy bias adjustment is ultimately unfounded? An interesting hypothesis that however proves invalid in the face of real-world observations? The story behind the ERSSTv4 dataset is almost weirder than the HadSST3 one. 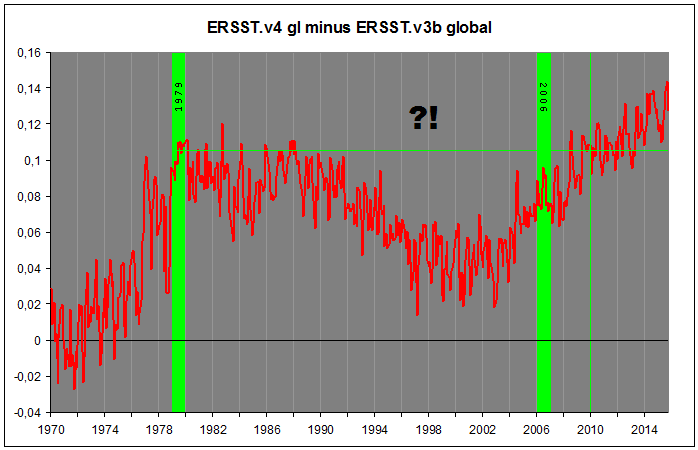 If there were indeed a need to adjust the averaged global SSTa up over time from ~1979 because of a temperature bias between ship and buoy measurements, then how come, if we subtract the unadjusted ERSSTv3b from the adjusted ERSSTv4 series, we get the following difference? Figure 12. Adapted from Kennedy et al., 2011. Quite steadily, from a mere 2.5 % in 1982 to a full two thirds (67 %) at the end of 2006. 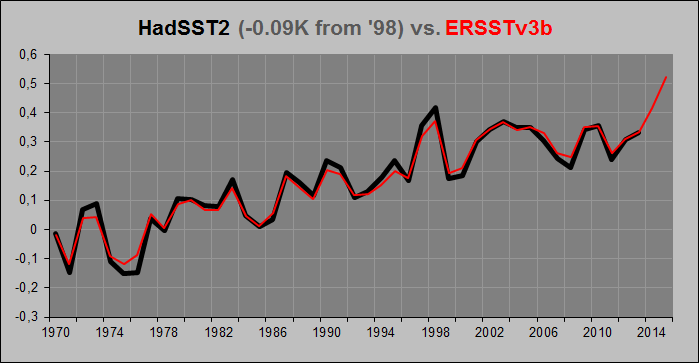 So how come the overall adjustment, going from ERSSTv3b to v4, is DOWN from 1979 (or 1982) to 2006? Shouldn’t it go distinctly UP? Why wait all the way until ~2004 before even moving in an upward direction? And why is the overall adjustment since 1979 only going positive beyond 2009 …!? To reiterate: What in the world is going on here!? And also, why that huge upward adjustment between 1976 and 1978/79, just before the earliest serious deployment of the temperature measuring buoys …!? This is where we’re getting to the crux of the matter. This stated ‘extra warming’, allegedly amounting to +0.06K since 1980, is obviously meant to be relative to the unadjusted ERSSTv3b series. However, when looking at Fig.11 above, it would seem that the extra warming in ERSSTv4 compared to ERSSTv3b is a mere 0.04 degrees. And that’s all the way down to the end of 2015. Just see for yourself. If you take a look at the GIF animation above, though, you will immediately discover the following: The two curves follow each other to near perfection, first from late 1976 to early 2006, and then again from mid 2006 till today. Near complete agreement all the way since The Great Pacific Climate Shift, except that ONE sudden shift occurring in the first half of 2006. The ERSSTv4 curve abruptly lifts about 0.05-0.06 degrees relative to the OIv2 curve. All in one step. Nothing before. Nothing after. So how do we explain this sudden upward shift? And how does it relate to that claimed +0.06K worth of extra warming from 1980 in the ERSSTv4 dataset due to the stated implementation of the ship-buoy bias adjustment? How come it’s apparently rather expressed relative to the OIv2 dataset than to the ERSSTv3b dataset? And why is it all seemingly contained within that ONE sudden step alone? And, maybe most importantly, is the reality of such a step justified by other relevant datasets? HadNMAT2 and HadSST3 both specifically don’t support it. 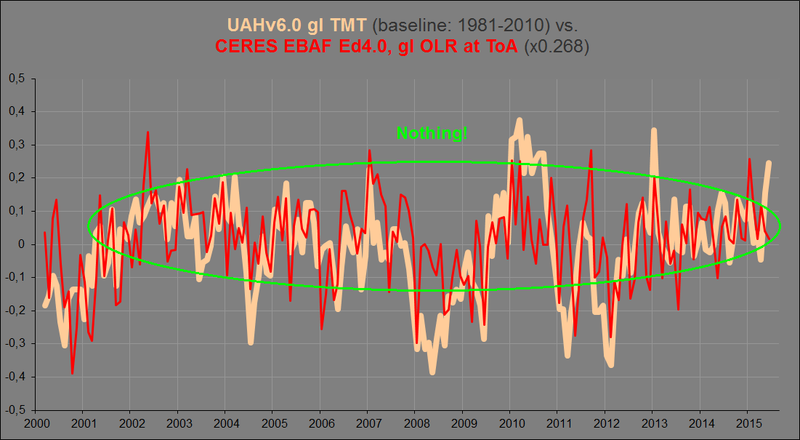 Satellite datasets (including ARC/AATSR, TMI, AMSR-E and AVHRR (OIv2 SSTa); UAH, RSS and NOAA/STAR (TLT, TMT, TTT); CERES (OLR at ToA)) don’t support it. ARGO doesn’t support it. (See the Addendum below.) Which means it’s an obvious methodological artefact, and nothing else. So why? Why is it there? Some plots to visualise how we can definitely tell that the ERSSTv4 adjustment apparently “busting ‘The Pause’” (1997/1998 – 2013/2014/2015) has no basis in the REAL world; it is fully and only a construction. Animation 3. There’s an obvious step change occurring in late 2003 in the (otherwise pretty tight) correlation between the two datasets plotted here (what happens before ~1975, I don’t know, but that’s another story anyway). Figure 14. NOAA mean ocean temperature, 0-100m (black), overlaying pure ARGO surface temps, 0m (gray); baseline: 2005-2014; 60N-60S. It’s time, then, to bring in the ERSSTv4 dataset. 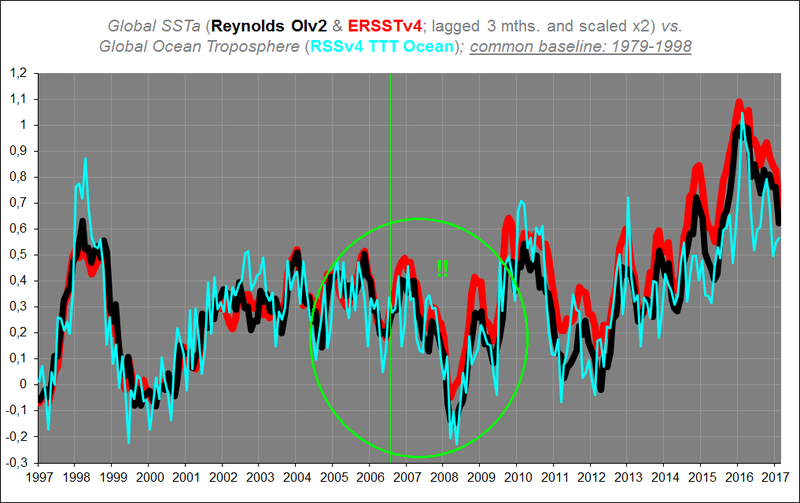 Remember the 2006 step change between it and the NOAA Reynolds OIv2 dataset in Anim.2 above. That’s the “Pause-busting” adjustment right there. But how does it hold up against ARGO? Animation 3. The red vertical line marks the conspicuous break between the OIv2 and the ERSSTv4 datasets (see Anim.2). They’re close to equal both before and after, the entire difference from 2003 to 2016 (all the way from 1976/77 to 2017, in fact) contained within that one sudden step alone. And as you can see, there is no justification for the ERSSTv4 “Pause-busting” (upward) adjustment to be found in ARGO, which simply tracks OIv2. Figure 15. As you can see, there is no visible step up in the red curve (ARC) relative to the yellow and black ones within the green ellipse (2004-2008). Figure 16. 38°N–38°S; red curve: TMI; yellow curve: OIv2; black curve: ERSSTv4. Figure 17. Global (~60°N–60°S); blue curve: TMI; yellow curve: OIv2; red curve: ERSSTv4. 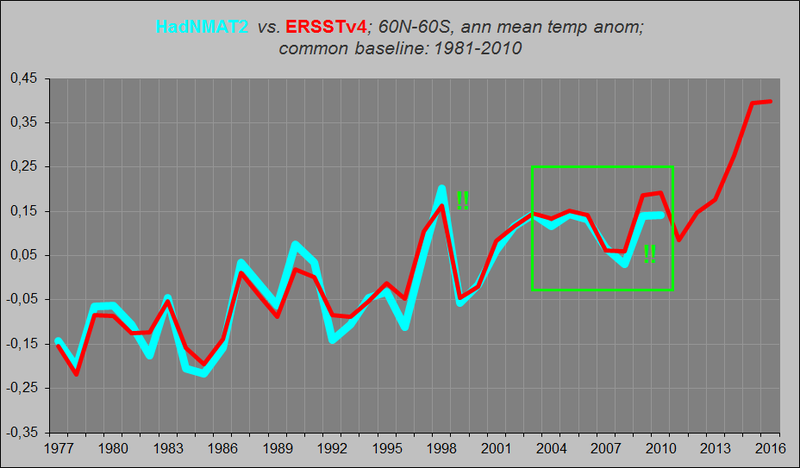 As is evident from the two figures above, the AVHRR IR satellite readings (OIv2) agree almost perfectly with both TMI and AMSR (both microwave satellite readings), while the ERSSTv4 has a distinct (and now more and more familiar) lift relative to both TMI and AMSR occurring around 2006-2007. 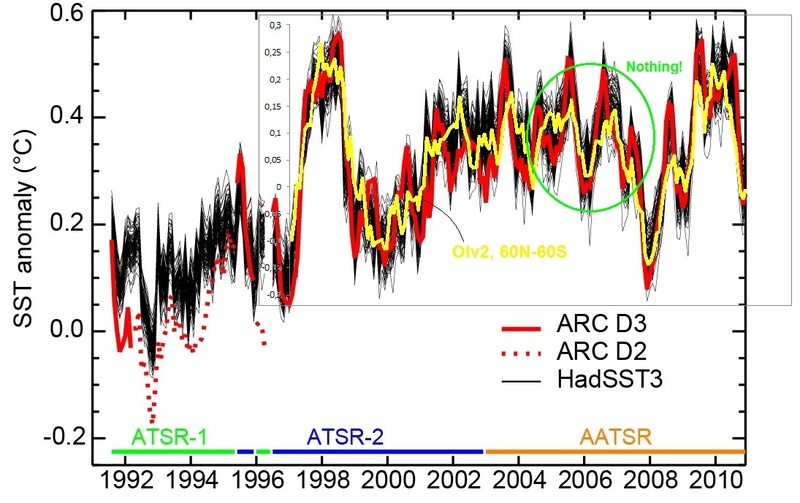 We’ve already touched on the next issue, the conspicuous discrepancy between two SST datasets that are supposedly adjusted according to the very same ‘discovered’ ship-buoy bias, apparently ‘necessitating’ an upward tilt of the overall SSTa trend from 1979-80. Strange, then, how the two teams in question (behind the HadSST3 and the ERSSTv4, respectively) seem to have chosen completely different routes towards achieving it (Fig.7). While the main goal of the folks at the Hadley Centre (Kennedy et al.) appears to be finding a plausible-sounding excuse for NOT correcting that obvious 1997-1998 spurious upward shift in the ‘old’ HadSST2 dataset, the main goal of NOAA (Huang et al.) rather appears to be “busting ‘The Pause'”. This becomes all too evident when comparing the two directly (Fig.7). Figure 18. 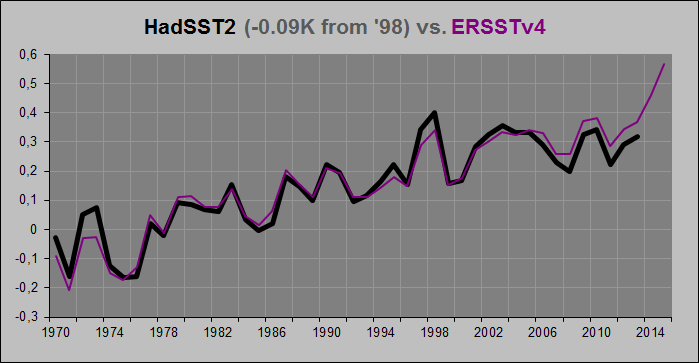 Note how in the ERSSTv4 dataset the 1998 peak is made distinctly lower than the 2009-2010 peak. We see this same conspicuous divergence when comparing ERSSTv4 with the Hadley Centre’s HadNMAT2, a dataset that Huang et al. plainly stated as an important source of validation for their own SSTa series. So what’s going on inside the green rectangle below? Figure 22. 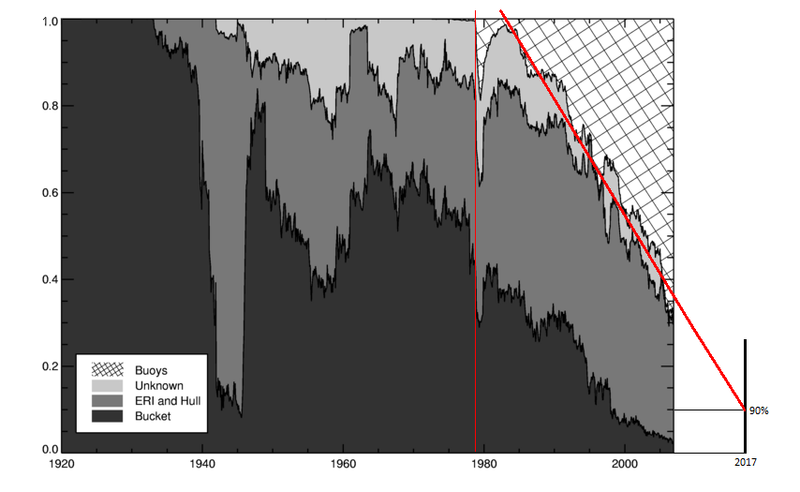 Note that the three TMT datasets here are all ocean+land, not ocean only like the RSSv4.0 TTT curve in Fig.20. The real divergence, though, still happens only in late 2013 and into 2014, with the firm establishment of “The Blob” phenomenon in the NE Pacific, one that is naturally much less pronounced in Fig.20. This entry was posted in Climate adjustments, Datasets, Observations & musings and tagged ARGO, Buoys, ERSSTv4, Global sea surface temperatures, HadSST2, HadSST3, Huang et al. (2015), Kennedy et al. 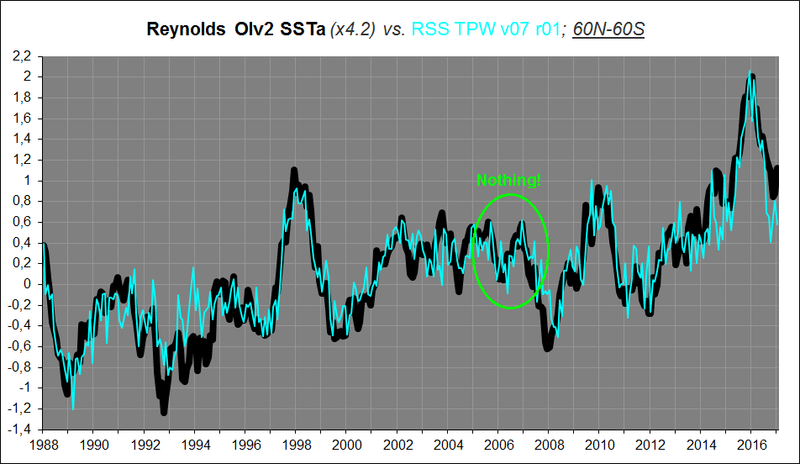 (2011), Reynolds OIv2 SSTa, satellites, Ship-buoy bias correction, step change. ← What caused the current ToA radiative imbalance? Interesting comparisons that leave plenty of room for doubt about accuracy. Did you see the WUWT post on Zeke Hausfather’s analysis that supposedly vindicates ERSSTv4 and do you have any thoughts on Zeke’s analysis? Of course I’ve seen his “analysis”. That’s basically what prompted me to go through the data myself. Hausfather is a staunch, policy-driven greenie (he basically admits this himself). He has an agenda. Hence, I have absolutely zero trust in any of his “analyses”. He’s simply not a neutral party in this. This “study” in particular comes off very much as a snow job and nothing else. He has clearly constructed his “datasets” himself. 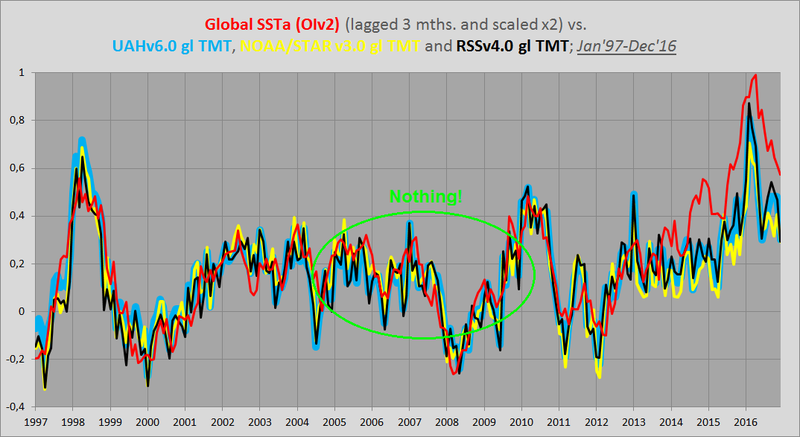 For a specific purpose: To “vindicate” NOAA’s upward SST adjustments, “busting ‘The Pause'”. 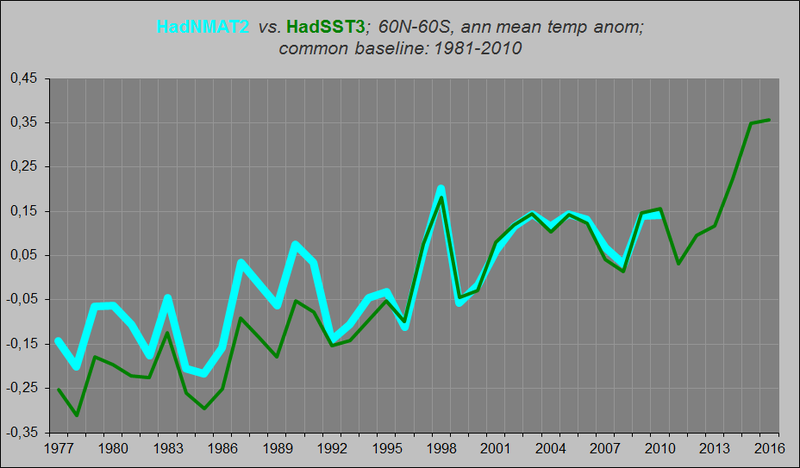 His data, however, bears no resemblance to anything else, notably not to all the official data from various sources that I’ve looked at (importantly, including ARGO buoy and satellite series (IR and MW)), which all point in the exact same direction: There is NO upward shift in the mean temp post 1998/2000.